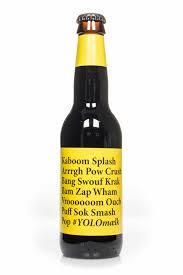 #YOLOmælk is the beer we’ve all been waiting for; an imperial salty milk stout brewed with caviar and champagne yeast. Yolo! Kasper Ledet on the design: #YOLOmælk is a rather extreme beer. It is brewed with caviar and champagne-yeast and It kicks in at 14.0% alc/vol. To illustrate this I decided to write a poem composed of onomatopoeia (words imitating sounds) since normal words didn’t seemed efficient. Lervig Toasted Maple Stout 330ml To Øl What the Fudge! ?